Lights Out For China's Solar Power Industry? China’s solar industry is a useful microcosm that illustrates larger flaws in the national economy. China’s photo-voltaic (PV) industry, better known as the “solar industry”, is in the middle of a serious crisis. The issue is particularly fascinating since it essentially serves as a microcosm for many of the troubles afflicting China’s economy as a whole, including government encouraged over-investment, an astounding run up of debt, government support of value-destroying firms, resulting trade frictions, and the tension between central and local government goals. Nearly all the “big names” of the industry, including companies such as LDK Solar, Yingli Solar (which sports fans will recognize from its sponsorship at recent international soccer events) and Suntech Power Holdings are all facing the possibility of bankruptcy, consolidation, or both following a remarkable few years in China’s solar industry. China’s solar module manufacturing capacity (supply) has exploded following the 2008 global financial crisis. 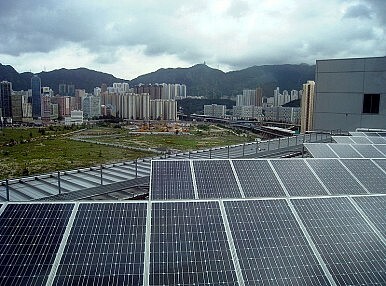 During the ensuing economic difficulties, the Chinese government targeted the solar panel manufacturing industry as part of its stimulus. At first glance, the policy was perfect. Demand for renewable energy sources was increasing due to environmental concerns while generous government subsidies in the EU and U.S. were boosting both household and corporate demand for PV panels. Funds were poured into the solar sector in China, and companies such as Suntech, LDK and Yingli were happy to borrow. China’s solar module manufacturing capacity grew from less than 5 gigawatts in 2007 to a predicted 50 gigawatts at the end of this year (China’s 2011 capacity came it at just under 40 gigawatts), more than double the rest-of-world (RoW) total. Unfortunately, demand for solar module installations has totally failed to keep pace with the mainly China-driven increase in supply. In 2007, total demand was also less than 5 gigawatts, but this has only increased to around 30 gigawatts today. Most of this increase has been in the RoW – China’s demand has picked up, from negligible levels in 2007 to an estimated 5 gigawatts at the end of this year. Meanwhile, the crisis hit EU subsidies, quite possibly because the supply side benefits were leaking abroad to China through its undercutting of EU producers’ prices. China’s solar module supply glut, as with many other products suffering from the country’s over-investment driven capacity increases, has thus decimated the global market. For consumers and the environment, this is a good thing, since PV modules are now cheaper than ever, but for other countries’ PV industries, the Chinese drive has been painful to say the least, with bankruptcies already hitting Q-cells and Solon in Germany and Solyndra and Evergreen Solar in the U.S. Trade tensions in the solar sector have inevitably increased, with both the EU and the U.S. bringing cases against China for dumping and unfair subsidies, which include underpriced financing, back home. The other result is that LDK, Suntech, Yingli and other Chinese firms are all on the verge of bankruptcy. During the boom years, they borrowed heavily to fund their investments. Now that prices have collapsed in the face of over-supply, Chinese PV firms are effectively incapable of paying back funds. As is often the case in China, what should be a clear cut case of down-sizing, bankruptcy or consolidation has so far been avoided thanks to massive support from local governments, which are unwilling to see unemployment rise in their areas. In particular, the governments of Xinyu and Wuxi have been trying to prop up LDK and Suntech, respectively. Banks have begun to grumble, with smaller lenders suing LDK and more action to come. Added to the legal troubles are the financial ones: Suntech’s upcoming due date of $541 million of convertible notes is over 3 times the company’s market value of $164 million. LDK’s total debt was more than 7.5 times its total equity at the end of the first half, which is triple the equivalent figure from the previous year. So far though, the major Chinese lenders have not cut off the struggling solar industry – probably due to government pressure. Chinese local governments are refusing to let the “natural selection” process go ahead. The central government is also boosting the amount of capacity to be installed in China, all of which is almost certain to go to domestic suppliers. However, even this will not be enough, since projected capacity installation still falls way short of China’s massive oversupply. Meanwhile China has launched trade cases of its own for some solar cell component parts which have inevitably seen exports to China rise. Consolidation is sure to be the theme in the global solar industry going forward, and as the installation capacity figures clearly demonstrate, the chief culprit is Chinese oversupply. For individuals knowledgeable about the Chinese economy this story is a familiar one: Government-pushed over-investment leads to serious overcapacity; the overcapacity is artificially maintained by local governments and state banks fearing the social fallout that could accompany market forces; despite the inefficiencies, operations continue; the supply glut inevitably leads to distortions and suffering in global markets as the subsidized, loss-making Chinese producers swamp markets; foreign countries are hopelessly slow to react, but eventually do so; prompting China to respond with far more dubious trade cases of its own. More broadly, what is happening to China’s PV industry is a telling illustration of some of the flaws in the Chinese economy. Time will tell if these imbalances can be corrected. China’s Empty Promises of Green Energy for AfricaThe Significance of China’s International Import ExpoChina’s Economy: The New Normal and the Virtuous CircleChina’s Zombie Companies and Japan’s Lost Two DecadesWill China Lead on Climate Change as Green Technology Booms?